KARACHI: SMB Fatima Jinnah Government Girls School, adopted by Shehzad Roy’s organization Zindagi Trust, won the Karachi United School Championship 2017, beating Lyceum 2-1 in the finals this weekend. Sixteen of Karachi’s top private schools, including Cedar College, Karachi Grammar School and Nixor College fielded teams in the tournament. The win completed a dream run for the SMB Fatima Jinnah Government School team, the only government school starring in the competition; they had also defeated Karachi Grammar School in the semis. 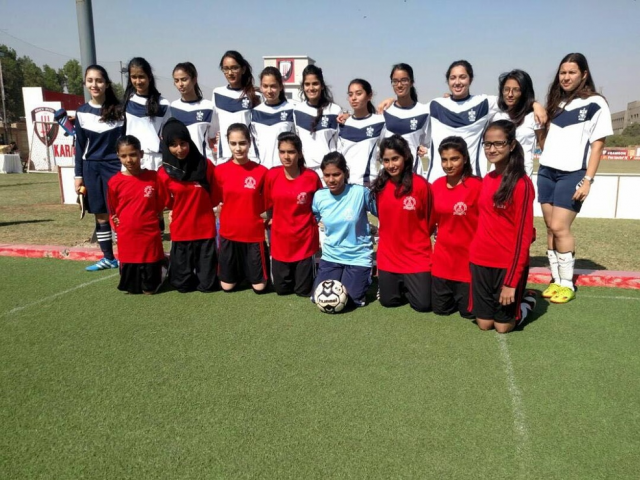 They also won two additional trophies, with 10th grade Roshana Jalal bagging the Most Valued Player award and Coach Fatima Kiran winning the trophy for Best Coach in recognition of her impressive mentorship, passion and tireless efforts for the team. SMB Fatima Jinnah Government Girls School is managed by Zindagi Trust under their School Reform project. One of the project’s core features is a strong sports program aimed at introducing students to different sports to help find and hone their talents and interests and develop them into well-rounded citizens.